With the holiday season upon us I thought it would be fun to look into the various traditions and cultural differences of Christmas – where did they come from and what do they mean? And why do so many people celebrate Christmas, even if it holds no religious significance to them? Christmas Day is usually celebrated as December 25th (although presents might be given as early as December 6th and as late as January 6th) and is widely seen as the birth of Jesus Christ. The name ‘Christmas’ therefore comes from ‘Christ’s Mass’ and can be traced back further: Christ goes through Greek to a Hebrew word meaning ‘Messiah’; and ‘Mass’ is the service celebrating the Eucharist (Holy Communion), named from the Latin word ‘missa’. ‘Nativity’ is from the Latin to mean ‘birth’ and ‘Noël’ is from old French, again meaning ‘birth’. Other names for the Christmas period have other roots. For example, ‘Yule’ is a really old Anglo-Saxon word and was used for the mid-winter festival. A Yule log is, quite literally, a log that was specially chosen and burned in the hearth. So where does the fat, jolly old man fit into this? He has various names around the world. In the UK and many other English speaking countries he goes by ‘Father Christmas’, whilst across a lot of the Western countries ‘Santa Claus’ is the name of choice. Father Christmas has been around since 1600 or so, but Santa is much more modern, really only getting big in the 20th century. Before that you were more likely to receive a visit from Saint Nicholas – a Christian and Greek saint from around the 4th Century. Saint Nicholas has many miracles attached to his name and a reputation for giving presents. 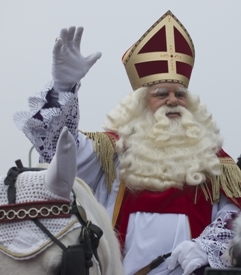 The name of Saint Nicholas became ‘Santa Claus’ via the Dutch transliteration, ‘Sinterklass’. The day of Saint Nicholas is December 6th and so some cultures will give presents on this day. Across much of Europe the gift-giver is Christkind, from the German meaning ‘Christ-child’. Christkind was introduced by a German friar from the 1500s called Martin Luther, and was as a purposeful rival to Saint Nicholas at the time of the Protestant reform. Christkind was intended to be the infant Jesus, but now many people see the being as an angel or cherub. Our own Aussie Kris Kringle comes from a mispronunciation of Christkind! As much as I hate to admit it, giving presents has got to be one of the biggest traditions at Christmas. So much so that it completely dictates our retail and economy for months! According to Christian stories, gifts were brought by the Wise Men for the baby Jesus. 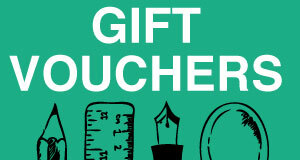 However, the tradition of gift-giving really stems from the Roman festival of Saturnalia. The festival honoured the Roman god Saturn and took place on December 17th, through to December 23rd. Saturnalia sounds like it was a really awesome festival. It was the one time of the year when normal Roman etiquette and laws were overturned so that masters waited on their slaves, gambling was permitted and there was a huge public banquet, carnival and of course, presents! The day of Saturnalia was a holiday from everything that counted as work. Schools, exercise, courts of law, even declarations of war. The last tradition I’m going to look at is the lovely Christmas tree, and this is another one stemming from Germany. The idea of dragging a tree into the family home gained popularity amongst upper classes in the 1800s, although the initial roots (!) started several hundred years before. Trees were originally covered with edible things like fruit and nuts. This gave way to candles, which in turn were replaced by electric lights and ornaments of all types. Again, Martin Luther has had a hand in this tradition as he is said to have placed candles in an evergreen tree. Pagans often worshiped trees so the Christmas tree may well have a pagan beginning. What’s your favourite Christmas tradition? Does it have a religious significance? Is it a cultural thing? Or do you just do it for fun? The featured image was borrowed and edited with thanks from Kevin Dooley under a Creative Commons licence and the photo of Sinterklaas was borrowed from Wouter Engler under a Creative Commons licence. 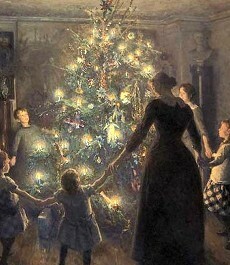 The painting of the Christmas tree by Viggo Johansen is in the public domain.